On 29 November I participated in a training session for Patients and Consumers interested in the activities of the European Medicine Agency (EMA). The EMA is the EU regulatory body responsible for the scientific evaluation and supervision of medicines developed by pharmaceutical companies for use in the European Union. Its activities range from providing scientific advice for the development of medicines, through the evaluation of marketing authorisation applications for medicines and the coordination of European pharmacovigilance to the provision of information on medicines to patients and healthcare professionals. Ever since its creation in 1995 the EMA has highlighted the importance of involving patients in their activities and procedures. Patients know about living with a disease. They are familiar with the needs of other patients and their family and they know what it is like to live with a disease on a daily basis. They know how diseases are managed, what treatment options are on offer and what needs remain unmet. They also understand what would be realistically feasible in a clinical trial design. The centralised authorisation procedure is rolled out in a number of scientific committees – in some of which patients act as full members – and supported by the EMA secretariat that is responsible for the interaction with patients and consumers. In its effective hands-on approach, the training focused on the way patients are called upon to contribute to the different steps of the centralised procedure. We as participants (patient and consumer representatives), interacted in different workshops with the people responsible for these steps at the EMA. The steps range from pre-submission stage (information and advice to the requesting companies on their development plans), the evaluation stage (examination of the request) and the post-authorisation stage (follow-up and monitoring of the marketing process). In preparation for the training, participants were given documents representing each of the different steps in the procedure and during the training we were invited to comment as we wanted, focusing on the practicalities of all aspects of the proposed medicines (clinical trial, feasibility of dosages and treatment, clarity and appropriateness of package leaflets, etc.). Patients’ input was very assertive and relevant contributing to great discussions. Patients can participate in the activities of the EMA in three ways. They can represent organisations in general by sitting in the management board and on some of the Agency’s scientific committees for example. Patients can also represent their own organisations such as within the Patients and Consumers Working Party (PCWP), throughout different consultations and also by taking part in workshops. This is the case of IPOPI, representing the views of primary immunodeficiency patients at the EMA. Lastly, patients can also be involved as individual experts within the evaluation of specific medicines. On 30 November, I had the pleasure of accompanying Jose Drabwell (IPOPI Chairperson) at a very interesting PCWP meeting. The PCWP was set up in 2006 by the EMA to serve as an information exchange platform with these stakeholders. 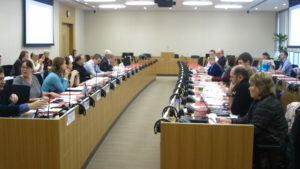 The membership of the working party consists of patients’ and consumers’ organisations, members of the scientific committees and observers from the management board and the European Commission. They meet 4 times a year at the EMA offices in London but they are also consulted on many of the Agency’s policies and other activities when necessary. Meetings are often held jointly with the healthcare professionals working party because of the many areas of common interest. Patients are also involved in a lot of other activities at the EMA, for example in conferences and workshops where they are frequently invited as speakers. I brought two highlights from my participation in the meeting. The first is related to very encouraging results of the different Topic Groups through which the PCWP tackles important issues for public engagement. The second was the presentation on EU-wide initiatives in genomics and the exciting developments in the use of biomarkers for personalised health care. It made clear the importance of the patients’ awareness and involvement in the matter. The EMA has an excellent website packed with information where you can register as an individual patient-expert.